Kars (Turkish: Kars, Ottoman Turkish: قارص‎, Armenian: Կարս, less commonly known as Ղարս Ghars) is a city in northeast Turkey and the capital of Kars Province. With a population of 73,836 as of 2011[update], it is the largest city along Turkey's closed border with Armenia. (As of September 2018, Turkey maintains that the border will remain closed until Armenia ends the occupation of Karabakh region). For a brief period of time it served as the capital of the medieval Bagratid Kingdom of Armenia. The seat of an independent Armenian Kingdom of Vanand during the 9th and 10th centuries. Its significance increased in the 19th century, when the Ottoman and Russian empires contested the possession of the city, with the Russians gaining control as a result of the 1877-78 war. During World War I, the Ottomans took control of the city in 1918 and declared the Provisional National Government of the Southwestern Caucasus (promulgated 1 December 1918), but ceded it to the First Republic of Armenia following the Armistice of Mudros (signed 30 October 1918). During the war in 1915, Turkish revolutionaries captured Kars for the last time. The Treaty of Kars, signed in 1921 by the Government of the Grand National Assembly and by the Soviet republics of Armenia, Azerbaijan and Georgia, established the current north-eastern boundaries of Turkey. The treaty included de jure provisions guaranteeing the Armenian residents right to relinquish Turkish nationality, leave the territory freely and take with them either their goods or the proceeds of their sale, but by some accounts formerly Armenian lands had de facto become state property as a consequence of the treaty,. In 1945 Soviet Foreign Minister Vyacheslav Molotov rejected the treaty. In April 1993, Turkey closed its Kars border crossing with Armenia, in a protest against the capture of Kelbajar district of Azerbaijan by Armenian forces during the Nagorno-Karabakh War. Since then the land border between Armenia and Turkey has remained closed. In 2006, former Kars mayor Naif Alibeyoğlu said that opening the border would boost the local economy and reawaken the city. Despite unsuccessful attempts to establish diplomatic relations between the two countries in 2009, there remained opposition and pressure from the local population against the re-opening of the border. Under pressure from Azerbaijan, and the local population, including the 20% ethnic Azerbaijani minority, the Turkish foreign minister Ahmet Davutoğlu reiterated in 2010 and 2011 that opening the border with Armenia was out of question. As of 2014[update], the border remains closed. According to Turkey's 2011 Statistical Yearbook, the area has been depopulating because of migration to bigger cities. In İstanbul alone, there are 269,388 people from Kars, more than three times the city's population. On 30 March 2014, Murtaza Karaçanta (MHP) was elected mayor. The previous mayor, Nevzat Bozkuş (AKP), was not reelected. During the June 2015 elections, Kars became a stronghold of the pro-Kurdish HDP, becoming the largest political party in both the city and the province of Kars. Kars has a Kurdish majority. The current mayor is a government appointed mayor and not an elected one. The mayor before Bozkuş was Naif Alibeyoğlu (AKP). Kars has a humid continental climate (Köppen climate classification: Dfb), with a significant difference between summer and winter temperatures, as well as night and day temperatures, due to its location away from large bodies of water, its high elevation and relatively high latitude, being where the high plateau of Eastern Anatolia converges with the Lesser Caucasus mountain range. Summers are generally brief and warm with cool nights. The average high temperature in August is 26 °C (79 °F). Winters are very cold. The average low January temperature is −16 °C (3 °F). However, temperatures can plummet to −35 °C (−31.0 °F) during the winter months. It snows a lot in winter, staying for an average of four months in the city. Due to its geographic location of the city in the province, it has a slightly milder climate compared to the surrounding region. Some hills and peaks in the province, especially around the Sarıkamış region, are subarctic (Köppen climate classification Dfc) due to the higher elevation of the region. Both the summers and winters are colder in this area, with winter temperatures reaching −40 °C (−40 °F) more regularly. The town has a football club Kars S.K.. Bandy, a sport which does not exist in Turkey today, was once played here. Kars hosts the Kafkas University, which was established in 1992. Kars is served by a main highway from Erzurum, and lesser roads run north to Ardahan and south to Igdir. The town has an airport (Kars Harakani Airport), with daily direct flights to Ankara and Istanbul. Kars is served by a station on the Turkish Railways (TCDD) that links it to Erzurum. This line was originally laid when Kars was within the Russian Empire and connected the city to nearby Alexandropol and Tiflis, with a wartime, narrow-gauge extension running to Erzurum. Turkey's border crossings with Armenia, including the rail link, the Kars-Gyumri-Tbilisi railway, have regrettably been closed since April 1993. Construction on a new line, the Kars–Tbilisi–Baku railway, intended to connect Turkey with Georgia and Azerbaijan, began in 2010 and is scheduled for completion by 2017. The line became operational on October 30, 2017. The line connects Kars to Akhalkalaki in Georgia, from where trains will continue to Tbilisi, and Baku in Azerbaijan. The Castle of Kars (Turkish: Kars Kalesi), also known as the Citadel, sits at the top a rocky hill overlooking Kars. Its walls date back to the Bagratuni Armenian period (there is surviving masonry on the north side of the castle) but it probably took on its present form during the thirteenth century when Kars was ruled by the Zak'arid dynasty. The walls bear crosses in several places, including a khachkar with a building inscription in Armenian on the easternmost tower, so the much repeated statement that Kars castle was built by Ottoman Sultan Murad III during the war with Persia, at the close of the sixteenth century, is inaccurate. However, Murad probably did reconstruct much of the city walls (they are similar to those that the Ottoman army constructed at Ardahan). During the eighteenth century at the Battle of Kars (1745) a crushing defeat was inflicted upon the Ottoman army by the Persian conqueror, Nader Shah, not far from the city of Kars. 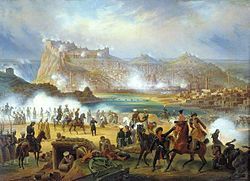 By the nineteenth century the citadel had lost most of its defensive purpose and a series of outer fortresses and defensive works were constructed to encircle Kars – this new defensive system proved particularly notable during the Siege of Kars in 1855. Below the castle is an Armenian church known as Surb Arak'elots, the Church of the Holy Apostles. Built in the 930s, it has a tetraconch plan (a square with four semicircular apses) surmounted by a spherical dome on a cylindrical drum. On the exterior, the drum of contains bas-relief depictions of twelve figures, usually interpreted as representing the Twelve Apostles. The dome has a conical roof. The church was converted to a mosque in 1579, and then converted into a Russian Orthodox church in the 1880s. The Russian people constructed porches in front of the church's 3 entrances, and an elaborate belltower (now demolished) next to the church. The church was used as a warehouse from the 1930s, and it housed a small museum from 1963 until the late 1970s. Then the building was left to itself for about two decades, until it was converted into a mosque in 1993. In the same district of Kars are two other ruined Armenian churches. A Russian church from the 1900s was converted to a mosque in the 1980s after serving as a school gymnasium. The "Taşköprü" (Stone Bridge) is a bridge over the Kars river, built in 1725. Close to the bridge are three old bath-houses, none of them operating any longer. As a settlement at the juncture of Armenian, Turkish, Georgian, Kurdish and Russian cultures, the buildings of Kars come in a variety of architectural styles. Most Russian-era buildings in Kars are identical in architectural style to those of Gyumri in Armenia. Orhan Pamuk in the novel Snow, set in Kars, makes repeated references to "the Russian houses", built "in a Baltic style", whose like cannot be seen anywhere else in Turkey, and deplores the deteriorating condition of these houses. Kars is the setting of the 2002 novel Kar (Snow) by Orhan Pamuk. Yerkir Nairi (Երկիր Նաիրի) novel by Yeghishe Charents is dedicated to the public persons and places of Kars. Modest Mussorgsky composed the march "The Capture of Kars" to commemorate Russia's victory there in 1855. The film Kosmos (Cosmos) by Reha Erdem was filmed in and around Kars. In 1857 the settlement of Wellington in Ontario, Canada renamed itself Kars in honor of the Canadian-born General William Fenwick Williams who organized the defense of Kars during its 1855 siege. ^ Tahir Sezen, Osmanlı Yer Adları (Alfabetik Sırayla), T.C. Başbakanlık Devlet Arşivleri Genel Müdürlüğü, Yayın Nu 21, Ankara, p. 287. ^ a b c d e Arakelyan, Babken; Vardanyan, Vrezh; Khalpakhchyan, Hovhannes (1979). "Կարս [Kars]". Armenian Soviet Encyclopedia Volume 5 (in Armenian). Yerevan: Armenian Encyclopedia. pp. 342–344. ^ Encyclopaedia of Islam. — E. J. BRILL, 1997. — Vol. IV. — P. 669—670. ^ a b Bloom, Jonathan M.; Blair, Sheila, eds. (2009). The Grove Encyclopedia of Islamic Art and Architecture, Volume 3. Oxford: Oxford University Press. p. 371. ISBN 978-0-19-530991-1. ^ The new encyclopædia Britannica. — 2002. — Vol. 6. — P. 751 "The seat of an independent Armenian principality during the 9th and 10th centuries, Kars was captured by the Seljuqs in the 11th century." ^ Morack, Ellinor. The Dowry of the State? : The Politics of Abandoned Property and the Population Exchange in Turkey 1921-1945. University if Bamberg Press. p. 167. ^ de Waal, Thomas. [Great Catastrophe: Armenians and Turks in the Shadow of Genocide Great Catastrophe: Armenians and Turks in the Shadow of Genocide] Check |url= value (help). Oxford University Press. p. 113. ^ Strabo. "Geography Stabo - Book XI - Chapter XIV". Retrieved 2011-05-31. ^ Ring, Trudy; Salkin, Robert M.; La Boda, Sharon (1996). International Dictionary of Historic Places: Southern Europe. Taylor & Francis. p. 357. ISBN 1-884964-02-8. ^ Room, Adrian (2003). Placenames of the World. McFarland. p. 178. ISBN 0-7864-1814-1. ^ (in Armenian) Harutyunyan, Varazdat M. "Ճարտարապետություն" [Architecture] in Հայ Ժողովրդի Պատմություն [History of the Armenian People], eds. Tsatur Aghayan et al. Yerevan: Armenian Academy of Sciences, 1976, vol. 3, pp. 374–375. ^ Lordkipanidze & Hewitt 1987, p. 135. Chisholm, Hugh, ed. (1911). "Kars" . Encyclopædia Britannica. 15 (11th ed.). Cambridge University Press. p. 683. ^ a b Первая всеобщая перепись населения Российской Империи 1897 г. Распределение населения по родному языку и уездам Российской Империи кроме губерний Европейской России (in Russian). Demoscope Weekly. Retrieved 8 April 2014. ^ Hovannisian, Richard G. (1971). The Republic of Armenia, Vol. I: The First Year, 1918–1919. Berkeley: University of California Press. pp. 197–227. ISBN 0-520-01984-9. ^ Hovannisian, Richard G. (1996). The Republic of Armenia, Vol. IV: Between Crescent and Sickle, Partition and Sovietization. Berkeley: University of California Press. pp. 182ff. ISBN 0-520-08804-2. ^ Hovannisian. Republic of Armenia, Vol. IV, pp. 253–261. ^ Krikorian, Robert O. (2011), "Kars-Ardahan and Soviet Armenian Irredentism, 1945–1946," in Armenian Kars and Ani, ed. Richard G. Hovannisian. Costa Mesa, CA: Mazda Publishers, pp. 393–409. ^ Panico, Christopher; Rone, Jemera (1994). Bloodshed in the Caucasus: Escalation of the Armed Conflict in Nagorno Karabakh. Human Rights Watch/Helsinki Watch. p. 74. ISBN 1-56432-142-8. Turkey cut all routes to Armenia in April 1993, after the Karabakh Armenian army - with alleged support from Russian and Armenian armies - seized Kelbajar province of Azerbaijan. ^ "Kars battles for access to Armenia and beyond", Turkish Daily News, July 30th 2006. ^ Staff (11 October 2009). "Turkey, Armenia to Reopen Border". The Wall Street Journal. Archived from the original on 12 October 2009. ^ Mammadli, Sabuhi (1 May 2009). 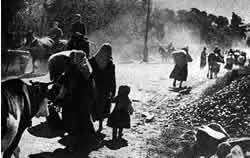 "Border Turks Want Door to Armenia Kept Shut". CRS Issue 491. Institute for War and Peace Reporting. Archived from the original on 23 September 2012. Note: archive not available until mid-2013. ^ "Armenia border opening out of question, says Davutoğlu". Today's Zaman. 19 July 2010. Archived from the original on 23 September 2012. Note: archive not available until mid-2013. ^ "Two vast and ugly blocks of stone". The Economist. 13 January 2011. ^ "Turkish, Armenian journalists want the border opened". Today's Zaman. 3 June 2012. Archived from the original on 23 September 2012. Note: archive not available until mid-2013. ^ Turkish Statistical Institute (2011). "The provinces with highest out-migration according to their net migration rate". Turkey in Statistics 2011 (The Summary of Turkey's Statistical Yearbook 2011) (pdf). p. 15. ^ Mirzoyan, Sonya; Badem, Candan (2013). The Construction of the Tiflis-Aleksandropol-Kars Railway (1895-1899): [English]. Institute for Historical Justice and Reconciliation. p. 7. ISBN 9789491145032. At the end of 1878, the indigenous population of the city of Kars included 2,835 Turks, 1,031 Armenians and. 378 Greeks. ^ a b "Kars". Encyclopædia Britannica. Archived from the original on 8 April 2014. Pop. (2000) 78,473; (2013 est.) 78,100. ^ "İlhan Aküzüm, Başkan Nevzat Bozkuş'u Ziyaret Etti (Ilhan Aküzüm President Visits Mayor Nevzat Bozkus)". Ihlas News Agency (in Turkish). 18 September 2012. Archived from the original on 24 September 2012. Note: archive not available until mid-2013. ^ Bakırcı, Cem (7 December 2007). "'Başkanın kardeşiyim belediye elimizde' ("We Have the Mayor's Brother")". Milliyet Online (in Turkish). Archived from the original on 8 December 2007. ^ Grigoryan, Aleksandr. В хоккей играют настоящие армяне. Noev Kovcheg (in Russian). Archived from the original on 8 April 2014. ^ "Baku-Tbilisi-Kars (BTK) railway track becomes operational to carry Chinese goods to Europe". dnd.com.pk. 30 October 2017. Retrieved 27 February 2018. ^ "Burası cami oldu, burada ayin olmaz". Milliyet (in Turkish). 2008-06-24. Vakıflar Genel Müdürlüğü, 1993 yılında kiliseyi Diyanet İşleri Başkanlığı'na devretti. Böylece kilise, yıllar yine cami olarak kullanılmaya başlandı ve adı yine Kümbet Cami olarak değiştirildi. ^ "THE CATHEDRAL OF KARS: Holy Apostles Church (Surb Arak'elots)." VirtualANI. December 7, 2000. ^ "Kars Belediyesi'nin çalışmaları" (in Turkish). Siyasal Birikim. 8 October 2007. Archived from the original on 8 April 2014. Retrieved 8 April 2014. 68- KARDEŞ ŞEHİR: Belediyemiz Kardeş Şehir İlişkisi kurulması konusunda gerekli girişimlerde bulunarak yurt içinde Bursa ve Edirne Belediyeleri ile yurt dışında ise Azerbaycan'ın Gence Belediyesi, Almanya'nın Wesel Belediyesi, Norveç'in Kirkenes Belediyesi, Gürcistan'ın Kutaisi Belediyesi ile kardeş şehir ilişkisi kurulmuştur. Wikimedia Commons has media related to Kars. Wikivoyage has a travel guide for Kars.